I’m hardly in the mood for a Good News Friday post today after hearing the dreadful news of the brutal murder of Ori Ansbacher, a young National Service girl, in a forest near Jerusalem yesterday. However, as always I don’t want to go into Shabbat without some good news, so here are a couple of items to lighten our spirit. The incendiary kite launched from Gaza touched down in the Gvaram conservation area on November 2, 2018, launching a fire that raced across the rolling hills and quickly turned everything black. Walking across the blackened landscape of the 12,000 dunam (3,200 acres) of forests that burned in the area around the Gaza border, charred grasses crunched underfoot and the smell of smoke lingered in the air. Fires sparked by flaming balloons and kites launched from Gaza also burned 4,000 dunam (988 acres) of farmland. Just three months later, the charred black that encompassed most of the Gvaram conservation area has been erased by an explosion of green and red. Winter grasses blanket the burned ground and the traditional red anemones, or kalaniyot, have burst forth across the fields and forests with a vigor not seen in the past decade. 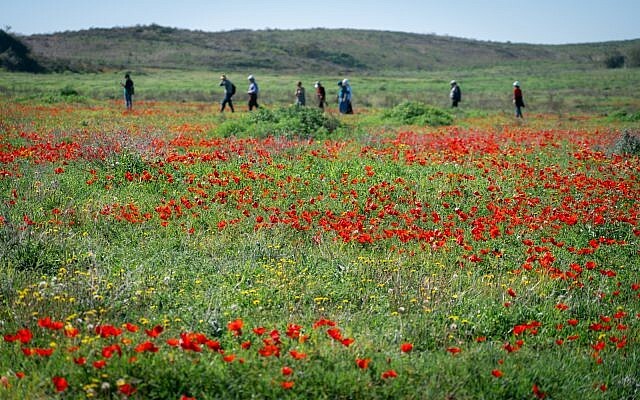 But after incendiary kites from Gaza burned some 16,000 dunams (4,000 acres) over six months, the kalaniyot bloomed this year without competition from other plants, creating a veritable carpet of red flowers, dancing in the wind. The contrast between the blackened fields of the summer and fall and the lush green and red is difficult to comprehend, even for the people who live here. “Someone comes here today looks around and says, no way this place burned,” said Sufer. In some places, the red flowers grow so thickly, it feels like the poppy field from the Wizard of Oz when Dorothy falls asleep. 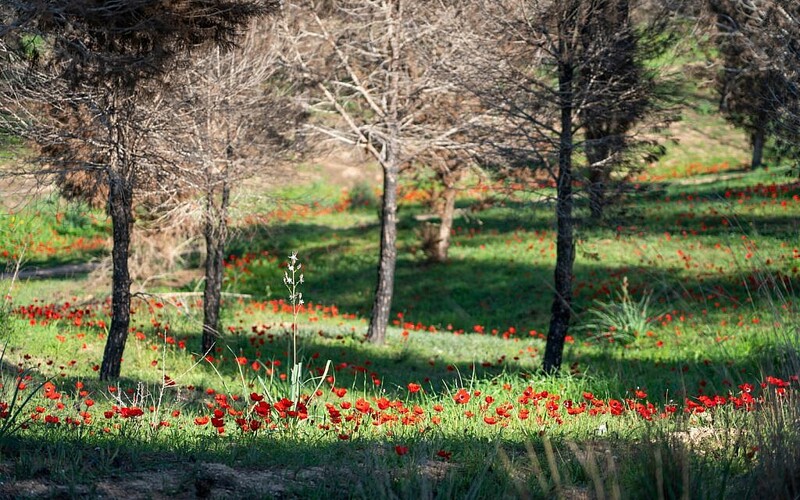 The annual Darom Adom (Scarlet South) Festival kicked off on January 31, with five weekends of events during February and March featuring one of the most dramatic blossoming of kalaniyot in the past decade. The festival, which attracted more than 60,000 visitors for the opening weekend, celebrates the kalaniyot that bloom every year in February, providing a riot of red under blue skies. The festival features dozens of free workshops, tours, concerts and children’s activities at a variety of spots across the Gaza periphery. Isn’t amazing that the fires started by our enemies to destroy us and our land have actually given forth more beautiful flowers than ever before? We give thanks to Hashem for His bountiful nature, and send our warmest wishes to the residents of the south who surely deserve a successful and joyous flower festival. This is a wonderful message to take with us into Shabbat. May the coming week bring us no more sorrow, only joy and good health. Wishing you all Shabbat Shalom, a quiet and peaceful Shabbat. 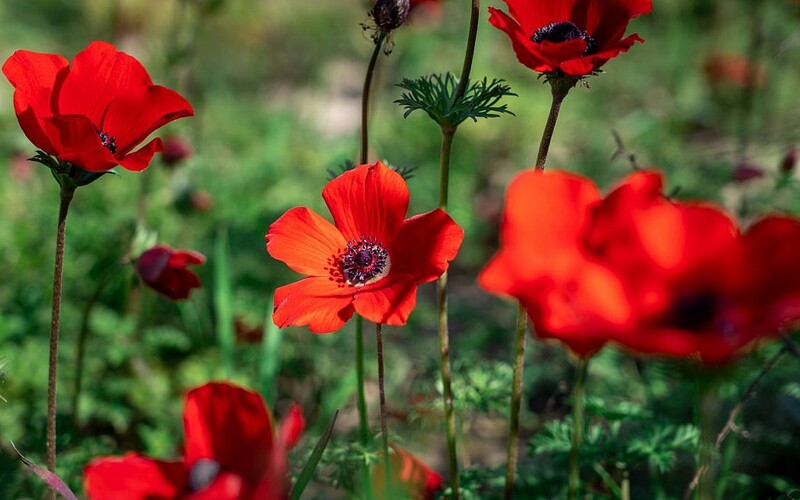 This entry was posted in Israel news, Judaism, Slice of Israeli life and tagged Darom Adom, flowers, Good News Friday, Sivan Rahav Meir, southern Israel, Torah. Bookmark the permalink. Thank you for this post.What a nice explanation of the Torah Portion. Thank you for the blooming wonderland. Hopefully, this can be seen as an addition to “Good News…”: this evening (aus – out of – Shabbat) we went to JW3 (the London equivalent of Manhattan’s Jewish Cultural Centre, or JCC) to Deborah Lipstadt give a talk (actually a Q & A with a former editor of the UK’s Jewish Chronicle, one Ned Temko) on her latest book “Antisemitism: Here and Now”. She, for those who don’t know, is the Professor of Jewish Studies at Emory University in Atlanta, Georgia, and has published extensively on topics both Jewish, antisemitism and Israeli. As always, she responded fluently, wittily and, always, with insight and brevity, to Ned Temko’s questions, as well as to those from the floor. I managed to get a question in: I asked her for her opinion on August Bebel’s (a 19th century German Social Democrat) aphorism that “antisemitism is the socialism of fools”. She responded as above. I, of course, wanted her to respond with relation to Jeremy Corbyn…and she obliged! I also ran into David Hirsh, the editor-in-chief of the (effectively and sadly) moribund engage online website, who thanked me for my question: I really want to get that quote out there to counter left-wing antisemitism. And yes, I have bought her book (I really like her writing style, as well as agreeing with her stances on things Jewish and Israeli), but it’s waiting for me in New York (for reasons too boring to relate here), so I had to request her signature on the ticket for the event. But we’re off there shortly, so that’s my book for reading just a little later this month. And so should you, if the reviews are anything to go by! Wows, sounds like a fantastic evening! I’m very interested in your review of her book. If you want to write a book review for this blog I’d be delighted. I’ve read 2 reviews, one full of praise and another one (in the JPost) damning her with faint praise, that she didn’t go far enough in identifying the source of antisemitism today in the left and/or Islam. Here’s the JPost link so you can compare your own impressions with the JPost author. Thanks for the link, Anne. I’ll get back to you fairly soon, as I collect there book in about 10 days time, and then expect to read it avidly!